The surprising 3-3 Jackets take to the road and try to land a statement win. Grit. This team has it. With obvious shortcomings in the talent department you cannot say that this team does not have grit, heart or as Isuro "Kamakazi" Tanaka would say: "marbles". The Jackets fought through injury and poor shooting to keep the Notre Dame Fighting Irish at bay last weekend. Now comes the real test. Duke, away. Georgia Tech has not won at Cameron Indoor Stadium since March of 2004. They also have not beaten a ranked opponent in a true road game during the Josh Pastner era. Things this year however have been more inspiring, if still ultimately unsuccessful. While Georgia Tech is 2-3 in true road games this season, they won at Arkansas (eh) and handled the Syracuse Orange at the Carrier Dome, their only ACC loss in five games. The Jackets also played now #1 Tennessee pretty well in Rocky Top and were blowing the doors off St. Johns on a neutral court before eventually collapsing in such a horrific fashion that only Stephen King could truly put it into words. Can Georgia Tech win? Sure. Could I receive my tax return before the end of February this year? Sure. Both are unlikely, but that is why you don't crown the champ in November. Duke is led by three burger boys who are currently projected to go in the 2019 NBA Draft Lottery. The most obvious is phenom Zion Williamson who came into the 2018-19 season with so much luster it seemed almost impossible for him to live up the billing. Incredibly, he has done just that. Named after the mountain that houses the holy land, Williamson has been remarkable in what will be his only season at the collegiate level, averaging 21.7 points, 9.3 rebounds and 2.4 assists per game. He has an effective field goal percentage of 69% and is the only player in the country that averages more than 20 points, 9 rebounds, 1.5 blocks and 2 steals per game. Canadian RJ Barrett, the #1 ranked player in the 2018 class, is starting to hit his stride as well. While he was not bad early in the season, he has recently discovered that nobody can stop him off the dribble when he goes left. He seemed to come to this realization during the second half of the game against Virginia when he only attempted a single triple and continuously went to the hoop. You can't argue with the results as Duke defeated the Hoos and, in my eyes, solidified themselves as the best team in the country. The third fiddle of the trio is Cam Reddish. A 6'8" high scoring wing, Reddish came into the season projected to be Duke's best three point threat. 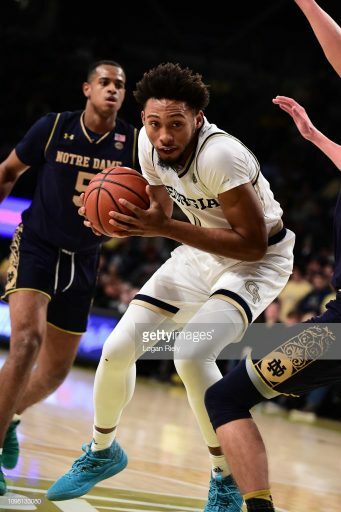 He has had his moments from deep (game winner against FSU in Tallahassee), he has had some struggles (1-9 vs Hartford, 1-6 against UVA) and is incredibly streaky. Don't sleep on him; when he decides to play he is as good as Barrett. His motor has always been the biggest question mark. Those three are the only Blue Devils that average double figures, but they combine to score an eye-catching 58.7 points per game. Duke will almost assuredly be without fellow freshman defensive stopper Tre Jones for this tilt. The younger brother of former Dukie Tyus Jones, Tre is currently out with an AC Joint injury. His absence from this Saturday's game can only be described as fantastic news for Jose Alvarado. Some other players of note in Durham this year are Aussie Jack White and former five star recruit Marques Bolden. White is a big shot guy who can hit the short corner triple and finish at the rim. He is a hustle player who also possesses a good bit of talent. Bolden, a much maligned player during his career, has yet to live up to his prep potential. He was singled out by Virginia in the showdown last week and the Cavs had a lot of success getting the ball to whoever he was guarding. Staying close is the name of the game here. Grab a carton of your favorite ice cream, a spoon and try to remain calm. You probably shouldn't expect to win, but let's try and not have a repeat of Louisville. FSU is below us in the standings and almost beat this team (Zion sat the second half) . Pitt is below us and kept it halfway respectable. Take enjoyment watching James Banks eat up Marques Bolden, hope for a moment such as Evan Cole cramming one down over Zion and pray for Jose Alvarado to get buckets and step over someone in Cameron a la Joel Berry in Chapel Hill last year. We played a great game. We shot the same fg% as them, had better 3 point%, was within 3 rebs of them, and had 10 Orebs to their 11. Turned it over too much but many were dead ball turnovers so not as big a deal. The difference in this game was 19-6 in the most predictable stat when playing at duke. gte447f, THWG, tbglover and 3 others like this. GTRX7, gte447f, THWG and 1 other person like this. New Old Guy, kg01, THWG and 1 other person like this. I just couldn't help but laugh when they called a reach in on Jose with about 3 minutes (IIRC) and it was on Jones. Dude had been all over Jose all game and really the one time we go to man, Jose tries to return the favor and gets called for a reach in. That epitomized the game for me. GTRX7, lauraee and Peacone36 like this. Pastner said in the post game that we need Banks and Gueye to be better. 9-21 and 10 rebounds aren’t going to get it done. THWG, CuseJacket and lauraee like this. I was actually quite proud of GT today. I remember just two years ago when I felt about AD the way most of us feel about Moses Wright today (DON'T DRIBBLE, and god no, DON'T SHOOT)....but AD has really turned into a nice big for us. If you can hold your own in Cameron, you can play anywhere. That we were ahead by 2 at the half and even more early in the 2nd half was.....completely unexpected. Quite impressed by the defensive effort and gameplan. I have not looked at scores, but this is the best showing I can recall against Duke (home or away) in some years. If this staff can develop someone like AD, maybe there is indeed hope for Moses and Evan next year and especially in their senior seasons. Overall, while the turnovers just drive me nuts sometimes....this was an effort that made me feel good. I will definitely be there Tuesday night to cheer us one against UNC. I think we have a shot at that game IF we have all our guys healthy. iopjacket, lauraee and THWG like this. Supersizethatorder-mutt, Silk3 and MiracleWhips like this. I was happy with parts of the game. Devoe is growing in his ball handling and ability to take point. Three point defense is getting good. Jose is improving, but he doesn’t have to be everything. We turned the ball over a lot, but some of it was aggressive play that didn’t quite connect. I saw some smart play where Duke played tough defense, and we were patient and found a way to get the ball to a teammate. I saw Cole make a really good pass to (I think) Moore when Cole was blanketed defensively. I saw Banks battling with four players around him under the basket. I saw Haywood sweep across the baseline beautifully, but get the ball swatted as he tried to lay the ball up past the basket; story of the game, maybe. Some people have mentioned the scoring difference at the foul line, but to me a huge difference was how Duke could score from 10-12 feet out. They were deadly there in the second half. AD has a hook he likes from two feet out that he’s about 50% with, but Duke seemed to be automatic with the 10’ jumper. I wish our bigs could do that. Kmag and THWG like this. 10 turnovers from our 2 point guards has got to get cleaned up for us to have any chance against good teams. 2/6 vs 16/19 from the free throw line is a recipe for disaster. I don't care how good they are, if you hold them to 2/21 from 3, you should have a pretty good chance to win... frustrating. If you were in atl, could've watched it on Peachtree tv. Tech played very well today. Not sure what you are bitc#ing about. slugboy and GTJason like this.